A reporter's post showing a meme put up by James Alex Fields. Facebook blocked a Charlottesville reporter who posted an Instagram meme used by murder suspect James Alex Fields in the months before the 2017 white nationalist rally. 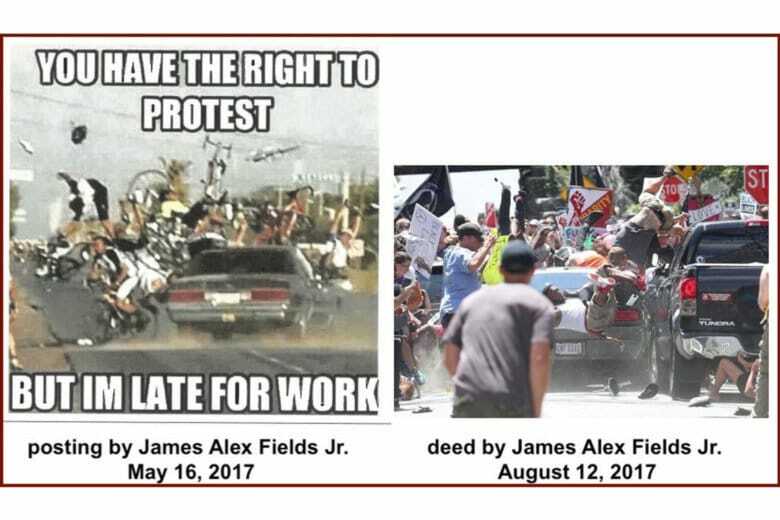 WASHINGTON — Three months before James Alex Fields allegedly drove his Dodge Challenger into a crowd of counter-protesters at a white nationalist rally in Charlottesville, Virginia, in August 2017, he posted an Instagram meme showing a car plowing into a group of protesters — but Facebook blocked a reporter who posted the meme in his coverage of Fields’ murder trial. Charlottesville journalist Hawes Spencer, whose book “Summer of Hate,” detailed the tension and violence before, during and after the Unite the Right rally, posted the meme after Charlottesville Circuit Court Judge Richard Moore ruled the meme admissible as prosecution evidence during Fields’ trial. In addition, jurors have also heard testimony from Ryan Kelly, who won the Pulitzer Prize for his photo showing Marcus Martin and others flying through the air after being struck. Prosecutors have argued the meme served as a “blueprint” for the attack. Yet, Facebook twice removed the images, saying they violated community standards. After the second instance, the social media giant blocked Spencer from posting content for 24 hours. Spencer, who is also an adjunct professor at James Madison University, said he was simply doing his job as a journalist, in reporting on evidence being used in trial. By Sunday evening, Facebook reversed course.